The Joker features a lite felt construction and a 3 1/8" brim. The Dri-Lex® sweatband and 3 1/2" telescope crown add style and performance. Unisex hat, The Joker will make you feel like a true renegade running the poker tables of your local saloon. The Lure of the frontier in the days of the days of the early to make any man from the east a natural gambler. This U.S. made felt hat is water resistant and finished and designed here in our shop. A locally made sterling silver concho accents the suede band. Brim is 3 inches wide and Crown is 4 inches tall. 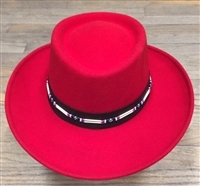 Color of hat band can be changed by request. Feel free to call us for more details. 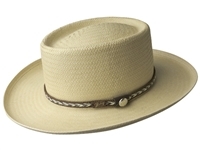 This U.S. made felt hat is water resistant and finished and designed here in our shop. A locally made sterling silver concho accents the suede band. Color of hat band can be changed by request. Brim is 3 inches wide and Crown is 4 inches tall. Feel free to call us for more details. This U.S. made felt hat is water resistant and finished and designed here in our shop. Brim is 3 inches wide and Crown is 4 inches tall. Color of hat band can be made by request. Feel free to call us for more details. 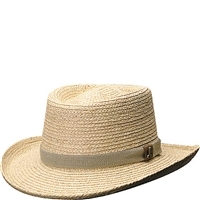 Parati Hats- This U.S. made felt hat is water resistant and finished and designed here in our shop.The hat contains a leather wind strap with locally made silver conchos. Brim is 3 inches wide and Crown is 4 inches tall. Feel free to call us for more details. The Rockett is a classic gambler style with a western edge. Made of toys straw. Includes an absorbent Dri-Lex® sweatband for comfort and coolness. Brim 3 7/8 Made in the USA.